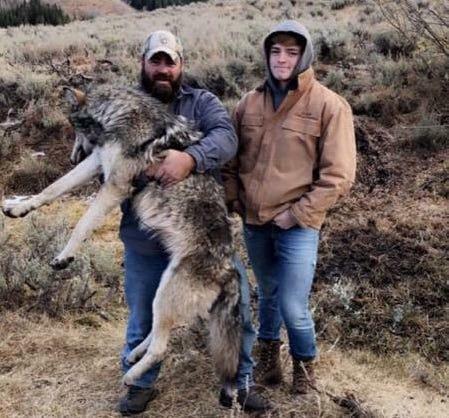 Trapper Rusty Kramer, left, stands with a wolf he harvested North of Anderson Reservoir in October, 2018. 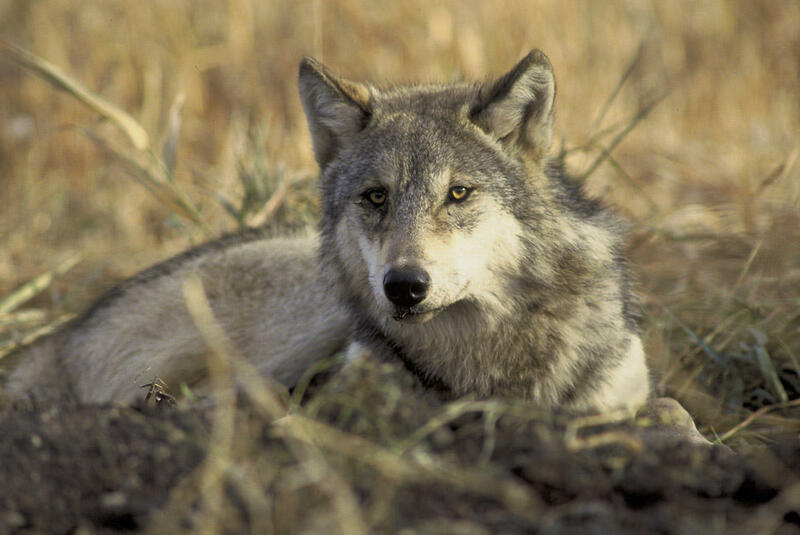 Gray wolves were removed from the Endangered Species List in Idaho in 2008. The federal government is weighing whether to lift protections for the species in every state. A wolf in Yellowstone National Park. Wolf hunting is currently legal in Idaho, Montana, and Wyoming. If you kill a wolf in Idaho, your effort might be worth $1,000. A nonprofit in North Idaho covers costs for hunters and trappers who successfully harvest wolves. The group, called the Foundation for Wildlife Management pays up to $1,000 per wolf harvest. The group has been around since 2012, and although some conservationists dislike it, there’s nothing illegal about the program. But what is new is the state of Idaho helping to fund the program. The Idaho Fish and Game Commission granted the Foundation for Wildlife Management $23,065 this year to help fund the payments for wolves harvested in target elk recovery areas. 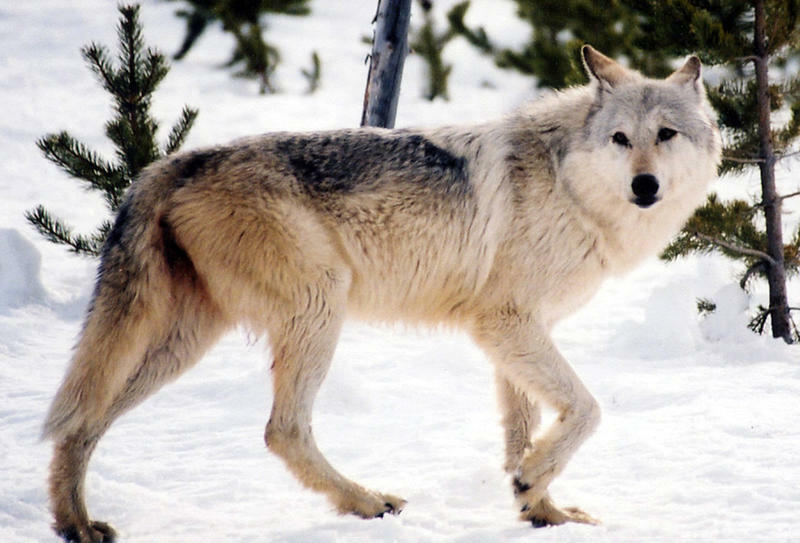 In many ways, Idaho has set the stage for state management of wolves in the West. Wolves were removed from the Endangered Species List in Idaho in 2008 and the state opened a hunting season on them the following year. Now, as the federal government weighs whether to delist the species nationwide, wolf management may soon fall completely to states. If that happens states like Colorado and Utah may soon be managing these top predators, and making their own rules around hunting and trapping. If more states take over wolf management within their own borders, how many will follow Idaho’s lead? Justin Webb, executive director of the Foundation for Wildlife Management, says the program helps reduce wolf populations in places where the IDFG wants to boost elk numbers — like the Lolo area in Northern Idaho. In 2018 the IDFG killed 10 wolves in the Lolo area to reduce elk predation. As a general rule, hunters play a key role in wildlife management by the state. “Our preferred and primary source for management is our hunters and trappers,” says Derick Attebury, chair of the Fish and Game Commission. That’s true whether the state is looking to boost pheasant populations, reduce mountain lion numbers, or remove wolves from the landscape. But the fact that the agency is funding a group that specifically incentivizes wolf hunting and trapping is drawing ire from some conservationists. “We think it’s pretty abhorrent,” says Andrea Santarsiere, senior attorney with the Center for Biological Diversity. "It’s not a public purpose. It's not what the state should be doing with its money." Attebury points out that IDFG revenue comes from hunting and fishing licenses, so technically it’s sportsmen, not taxpayers, who are paying for the program. The Foundation for Wildlife Management was one of 11 organizations to receive grant funding, and according to state records, the median amount granted last year was $5,000, The funded projects are diverse, with dollars going toward everything from covered shooting platforms for a local gun club to a habitat restoration project led by Trout Unlimited. Attebury says that, like legal wolf harvest, all of the projects fit with IDFG’s wildlife management objectives. Suzanne Stone with Defenders of Wildlife isn’t buying it. “It’s really troubling that the state of Idaho is doing this,” says Stone. She believes this decision is a sign of something much bigger: that the state is treating wolves differently than other predators. For example, she says there’s no bounty program for mountain lions, and hunters and trappers can take far more wolves than cougars. This year, IDFG also expanded hunting and trapping opportunities for wolves. Stone says this goes against what the state of Idaho promised when the species were removed from the Endangered Species List in Idaho back in 2008, which was to manage wolves like bears and mountain lions. “That was their specific promise to the federal government when wolves were delisted. And they are doing everything but that,” Stone says. That discord is also echoed in state data comparing mountain lions and wolf predations. Stone believes the state’s management of wolves is rooted in public animosity for the species, and that drives political decisions about hunting seasons and other management decisions. “It’s based on superstition, fear, hatred of the species,” she says. But hunters and trappers like Justin Webb say that’s far from the truth. “They are the smartest, most cunning, beautiful, most amazing animal I’ve ever encountered,” says Webb. But he says there are far too many of them on the landscape, and the reimbursement program is a way to help hunters and trappers have a role in keeping wolf numbers down. Trapping in particular is expensive and time consuming. A trapper might set 70 traps that cost $100 each in a given area. They’re required to check traps every three days, all winter long, which requires a lot of gas and time. For Rusty Kramer, who spends all winter hunting and trapping, it’s worth it. “It’s kind of like Christmas every day. You go check 70 traps, and it could be nothing all day long, or it could be five skunks, or you could have ten coyotes. Or you could have a wolf,” says Kramer, who is a board member for Idaho Foundation for Wildlife Management and president of the Idaho Trappers Association. A couple of years ago, he did get a wolf. “I yelled over the hill to my dad, and I says, ‘oh, got a wolf over here!’ and he thought I was messing with him. It was like a salt and pepper, two-year-old female,” says Kramer. Rusty Kramer, president of the Idaho Trapping Association, demonstrates a foothold trap for coyotes or wolves. Justin Webb says he’s personally harvested 18 wolves, mostly through trapping. “For that I’ve invested 208 hours and over $1600 in fuel for every wolf that I’ve caught,” Webb says. To participate in the Idaho Foundation for Wildlife Management program, hunters and trappers pay a membership fee and then if they get a wolf, submit receipts. They can get reimbursed for gas, traps, bait and firearms. In addition to the IDFG dollars, Webb’s group is funded by annual fundraisers, memberships and the Rocky Mountain Elk Foundation. The organization has support from some political heavyweights in the state. Idaho Governor Brad Little attended a past banquet, according to the group’s website. Idaho is not the only state to allow bounties. Utah pays coyote hunters and there’s a coyote bounty contest in Wyoming every year. Wildlife bounties are illegal in Montana, but its legislature is currently debating a bill that would specifically legalize reimbursements for wolf trappers. The federal government is weighing whether to remove the gray wolf from the Endangered Species List nationwide. 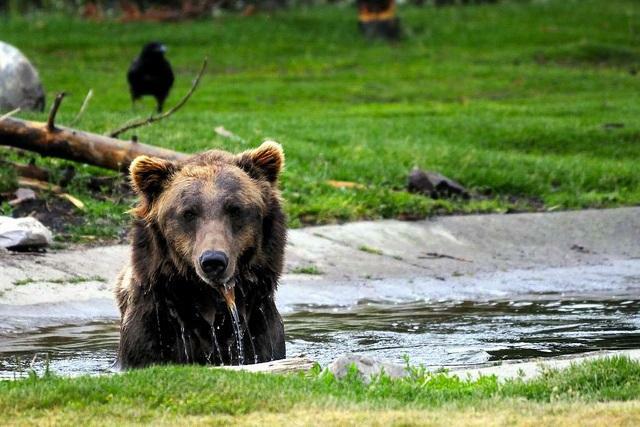 If that happens, their management will happen at a state level, and places like Colorado and Utah may soon be grappling with questions around the hunting ethics and management of these top predators. Gray wolves were taken off the endangered species list in Idaho and Montana last year and put under state control. But they're still on the list in neighboring Wyoming. That's because Wyoming has been the most aggressive about wanting to kill wolves. Wyoming has finally struck a deal with the federal government regarding how wolves will be treated once the state takes over. But environmentalists believe the agreement denies wolves an important refuge.